I recently saw a demo of Aderant’s new matter planning and forecasting application, and this appears to be a serious step forward for firms looking to integrate true management into the “living matter” (as well as the preparation for it). While this new application seems incredibly robust, some firms may be asking themselves, “how/where should this tool fit into our existing processes?”, “who should be driving it?”, or, maybe even, “does this represent too big a project for us at this point?”. Managing matter financials has always been a critical responsibility, but the discussion of it has never seemed more timely. What I want to show in this post is how a few small customizations to the Aderant Matter Maintenance and Enhanced Time Entry application can get the firm’s user base (at least) thinking more about matter management, and (ultimately) improve the quality and profitability of its engagements. Ok, so, a caveat: this post is most relavent to firms using the Aderant Time Entry tools (and probably where fee earners are actually doing the time entry). While I’m sure the same data could be fed back and presented in almost any time entry system, this post will refer to using the Aderant tool set to achieve this. While it is not essential to include, (as you can see below) my first step is going to be to add a custom field to track matter fee estimates. Even without a sophisticated forecasting or modelling tool, at the point of matter inception a fee earner likely has some idea of what they are going to bill a client over the course of the engagement – and if it needs to be adjusted, there is no reason why it couldn’t be at a later date. So the first task is to create a placeholder for this by creating a custom field in TBM or HBM_MATTER. 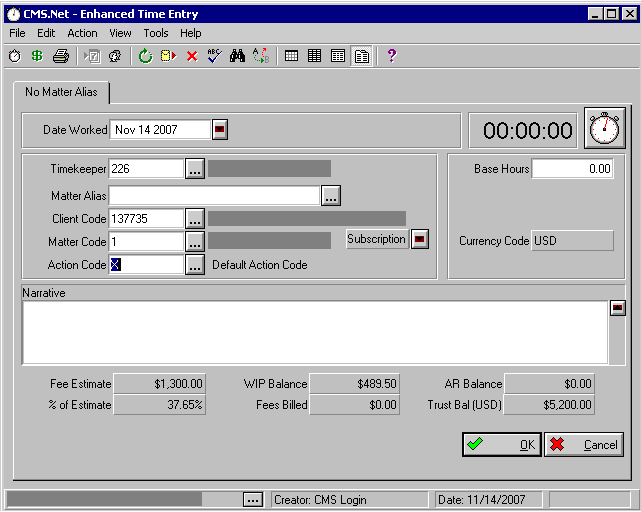 Once created through DBEDITOR drag this onto one of the Matter Management forms (like TBMMATT3). So not only do we include the new Fee Estimate, but we can show the current WIP balance, Fees billed to Date, and the % of the Estimate utilized to date. And why stop there? Why not show the users any outstanding AR and Trust balances? This gives the user a matter summary at probably one of the few places they actually touch the PMS. This entry was posted in Aderant Expert. Bookmark the permalink.